In general the development of kindling from other limbic sites proceeds in a manner similar to that described for the amygdala. Kindling of the hippocampus or piriform cortex, for example, involves progressive changes in the complexity of the ADs that mirror those described above for amygdala kindling. Associated with changes in the electrographic response is a heightening of behavioral seizure activity that eventually culminates in a stage 5 rearing and falling convulsion. Although, with the exception of higher AD thresholds in the piriform cortex, there is little difference in kindled seizure expression between the basal amygdala and the piriform cortex,34 subtle differences are apparent when kindling from the hippocampus. 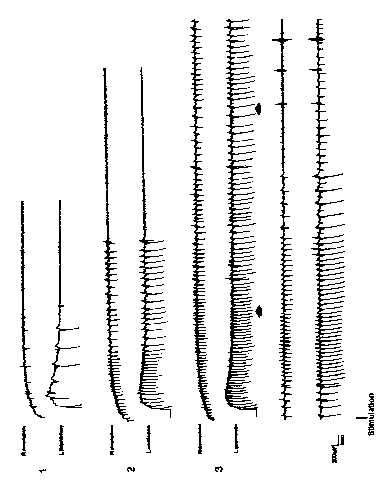 A series of electrographic traces taken from a rat at various times throughout amygdala kindling. This particular rat was stimulated in the left hemisphere (L). The top trace represents the initial AD trial. Note that there is minimal propagation to the contralateral hemisphere. 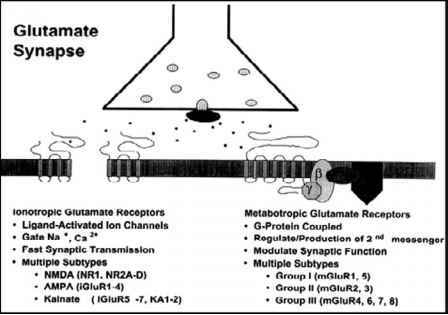 Trace 2 represents the electrographic seizure activity observed on the fifth stimulation. Note the increased strength of propagation into the contralateral site, as well as the increase in duration and complexity of the EEG. The bottom set of traces are associated with the first stage 5 convulsion (occurring between the two arrows). Note the significant prolongation of AD duration. clonus and mild episthotonus. A prolonged clonic response with rearing and falling often develops with subsequent hippocampal stimulations and follows the epistho-tonus response. In this particular group there is often little evidence of the stage 1 to 2 behavioral responses noted from other limbic sites. Although these seizure responses differ from the typical stage 5 seizure responses described for the amygdala, they are often scored as stage 5 seizures. The procedure in our laboratory is to classify such seizures according to Racine's classification system of amygdala kindling, while noting the exact nature of the motoric seizure. As a cautionary note, it has been observed by several investigators that there is an increased aggressive response in hippocampal kindled rats immediately following evoked seizure activity.40 Such responses are not common to amygdala kindling. This postictal aggression will dissipate if the rat is allowed to recover for 5 to 10 min before removal from the stimulation chamber.